Each of these examples contains some key information about the initiative. Additional information can be found by following the links at the end of each description. Links to additional case studies are included at the bottom of this page. Maine launched the first US statewide 1:1 initiative in 2001. Schools: 662 schools, includes 226 middle schools (grades 7-8): 131 high schools (grades 9-12) across 1-8 school districts. Governance: As with most US schools, funding and all policy is by school districts through property taxes with state top-up through General Purpose Aid to Education. Technology format: 95% laptops. From 2001 to 2013, the deployment was 100% Apple middle school, 75% Windows high school. In 2013, middle schools switched to largely Windows. Device numbers: approximately, 80,000 laptops across the state. Date program initiated: State deployment commenced in December 2001. Expanded to high school program in 2009. Equip all teachers and students with a laptop in order to prepare Maine’s students for a rapidly changing world. To provide anywhere, anytime access for all and that all students and teachers have appropriate and equitable opportunities to use digital devices. Implementation strategy: Statewide staged rollout for Year 7 in 2002, followed by same next year. High schools made their own choices. Apple and state built a statewide support infrastructure. Expanded to high schools in 2009. 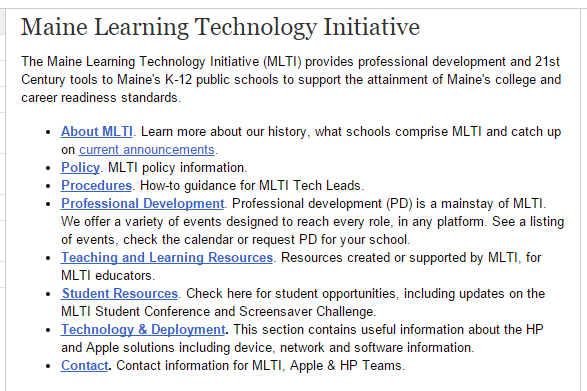 Pedagogical strategy: Maine Learning Technology Initiative (MLTI) was established in 2002 to provide professional development and 21st century tools to middle and high schools to support the attainment of the Maine state standards. Technology priorities: Partnership between Apple and state rapidly built a statewide backbone with technical support. Single platform agree to in middle schools. Funding source: State grant of $38 million, funded again in 2006 and 2009. How will it be sustained? Dependent on state funding. The courage of then Governor Angus King to set a countrywide precedent in providing leadership to launch the initiative for all middle schoolers across the state of Maine. At the same time, the focus was on learning and therefore technology decisions were made on the basis of what was the best learning solution. Couple of challenges that come from being a pioneer…. Initially students couldn’t take their laptops home. Rectified by Year 3. No thought given initially for high school students. Rectified in 2009. Challenging funding model: relies totally on state funding. Technology problems were minimized because of the choice of a single model, single platform. Focus on learning meant they have invested heavily in teachers’ professional development through Maine Learning Technology Initiative (MLTI). Victoria is the birthplace of 1:1, where the first 1:1 initiative began in 1990. Student/teacher numbers: approximately 840,000 students, 68,000 teachers. 1 in 3 students in Victoria attend a non-government school. Governance: 92% budget controlled at school level. Overseen by local school council. Technology format: 85% laptops of which 30% are Apple, the balance Windows. Device numbers: approximately 380,000 laptops across the state, 50% private schools have 100% Gr 5-12. All teachers and students have access to contemporary technology and world class digital content with which to create, communicate, and collaborate locally and globally. Student learning is engaging, personalized, and authentic to enable them to become confident and creative individuals and active and informed citizens of the 21st century. 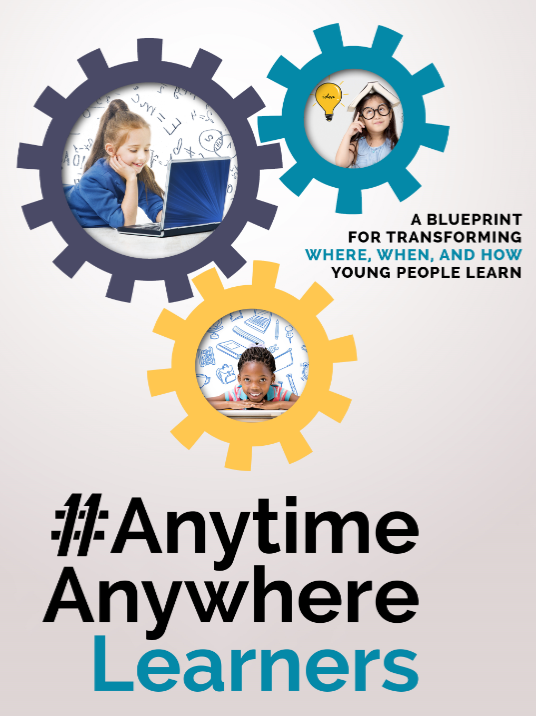 Anywhere, anytime access- all students and teachers have appropriate and equitable opportunities to use digital devices and systems, including access to a range of contemporary digital devices and sophisticated online systems that support learning, teaching, and knowledge sharing. Advancing teaching practice – all teachers and school leaders build capabilities to use digital technology to improve student learning. Access to high quality resources, tools, and data – all teachers and students have access to quality assured digital resources, tools, and rich data sources. Implementation strategy: Followed the national Digital Education Revolution program, rollout by those schools in most need, for all students in Grades 9-12 over 4 years. 21 Steps for 21st Century Learning(R) workshops for all schools. Pedagogical strategy: ePotential training expanded. EduStar software profile established supported by training. Technology priorities: Infrastructure upgraded across the state for increased numbers of devices. Bandwidth included. Device choice was from a panel at school level. Average device: $500-600. Funding source: Initially, $1.2 billion, but expanded to $2 billion for technology and training support, in total at $2000 per student over 4 years. How will it be sustained? Change of federal government meant the end of DER. Victoria is reviewing options, most moving to blended BYO, with many opting for co-contribution programs. Victoria teachers have had their own laptops for over 10 years and are therefore comfortable using technology. Subsequent to that, schools had reasonable broadband and infrastructure. Gradual, staged statewide school-based rollout was well managed. Some poor school-based device decisions, based on cost rather than capability. Associated statewide Ultranet student management system was an expensive failure. Given the time and money being invested, the pedagogical outcomes should have been higher; lack of leader expectations at both school and state level possibly contributed to that. Device numbers: proposal is for approx 640,000 laptops across the District. The Common Core Technology Project (CCTP) is laying the foundation to provide an individualized, interactive, and information-rich experience for every student. There are many key components to the project including providing each teacher and student with a mobile device, creating systems to distribute content and configure devices easily and remotely provide every student with an individual online account, email, software to enable sharing content easily among teachers, students, and parents, and professional development for our educators to facilitate the transition. Implementation strategy: Rolling out 31,000 iPads in 2013, with all 640,000 by end of 2014. Pedagogical strategy: Teachers to be provided with in-service support while roll-out is proceeding. Technology priorities: Each student is receiving an iPad pre-loaded with educational applications and other programs that will be used by the students in their studies. Funding source: a $1 billion construction bond, with $500m for devices and $500m for infrastructure. For more information: LAUSD Releases Follow-Up Report On Instructional Technology Initiative, The LAUSD iPad Initiative: 5 Critical Technology Integration Lessons, What Went Wrong with L.A. Unified’s iPad Program?